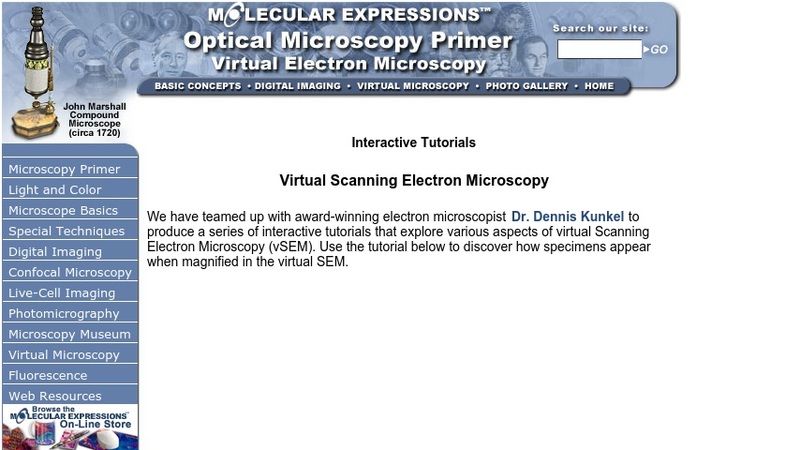 This Java applet allows students to interactively explore various specimens as they appear under a scanning electron microscope (SEM). SEM is a type of electron microscope that images the surface of a sample with a high-energy beam of electrons. It can produce very high-resolution photos of details as small as 1-5 nanometers. Choose from a cockroach, pollen grain, a diatomic molecule, a gecko foot, a jellyfish, and more. Users first adjust the focus, contrast, and brightness of the specimen to optimize its appearance. Then they use a slider to incrementally increase the magnification up to 10,000x. This item is part of a much larger collection of optics and microscopy materials developed at the National High Magnetic Field Laboratory at Florida State University.